I love 3D printed fashion. Not only has the medium allowed for incredible geometries and textures that would be impossible to create by other means, but it also gives designers more freedom to incorporate smart materials, kinetic elements and other high technology directly into clothing and jewelry. I love seeing the creativity of emerging designers in the growing field of 3D printed fashion, and was thrilled to see my first-ever 3D printed fashion show earlier this year. 3D printed fashion has one thing in common with other, more “traditional” forms of high fashion: while I’m awed by the stunning creations that grace the runways, I can’t imagine wearing a lot of them in real life. That’s not the case, however, with the work of Monika Januszkiewicz, a fashion student about to complete her final year of Fashion and Textile Buying Management at the University of Huddersfield in West Yorkshire. She began to explore 3D printing when researching for her final dissertation, and in a mere two months, she created a gorgeous 3D printed dress that is not only a marvel of design, but that I would feel completely comfortable wearing out on the town. The dress is actually only a part of Januskiewicz’s final project; the central focus of her dissertation is the creation of an app that would allow users to download and print their own clothing, as well as sharing their own designs with a community of fellow users. As a demonstration of the app’s potential, she worked with the UK branch of Materialise to design and print a dress. 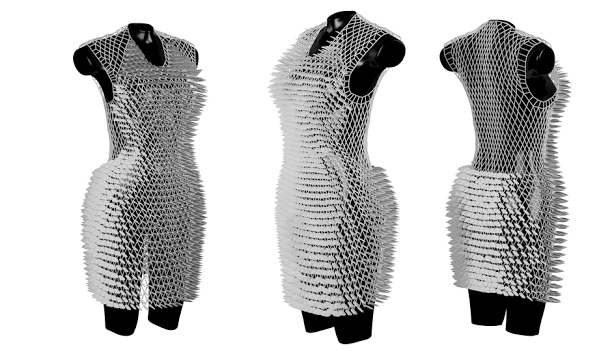 She enlisted the help of her friend, 3D artist Piotr Dziubek, to design the dress, which was inspired by dragon scales. Dziubek used Marvelous Designer, 3ds Max and Zbrush software. Januskiewicz, who counts Iris van Herpen, threeASFOUR and Nervous System as her inspirations, came across Materialise and their TPU 92A-1 material during her research. TPU 92A-1, a durable, flexible and elastic material, lends itself well to fashion design, and first appeared on the runway in a showcase of van Herpen’s designs at Paris Fashion Week in 2013. The finished dress was designed and printed as a mesh with interlocking scales – about 2,000 of them altogether, resulting in a striking garment that makes me think of a modernized version of a 1920s flapper dress. The dress also strongly shows the influence of Januskiewicz’s inspirations, particularly Nervous System, creator of the Kinematics Petal Dress. It resembles a shower of white petals while at the same time retaining the dragon-scale look that Januskiewicz originally intended, giving it a delicate yet tough dichotomy. The final project received top marks. Januskiewicz hasn’t said what she’ll be doing after graduation, but I hope she continues to work with 3D printing as well as marketing her app – I think an online, fashion-centered 3D printing marketplace would be a huge success, particularly one that allows users to print their own clothing. She clearly has a lot of talent, too – perhaps we’ll be seeing her work on the runway alongside van Herpen’s before long. Discuss further in the 3D Printed Dress for Dissertation forum over at 3DPB.com.